Have you ever been in the middle of washing a load of clothes and all you hear is an incredible amount of noise like something is about to come through the wall structure? This loud sound is an indication that the washer is off balance. This can cause the machine itself to shift and more. This is an easy fix and won’t cause too much damage to your property or machine if corrected in a timely fashion. You can do this with no help. 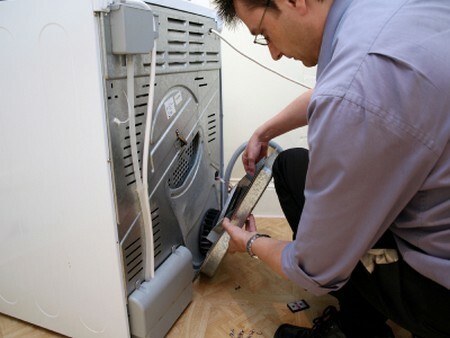 Here is how you can repair a washing machine. Read on for more information. When you first hear the machine banging around, go to the laundry room and turn the machine completely off. The machine may still be in the middle of a wash cycle, however, switch the washing machine completely off. This will reset the machine and help to resolve the current issue. Raise the lid of the washing machine. Inspect the load being washed in the bowl of the machine. Take note of the positioning of the clothing. More than likely, a large amount of the load has collected to one side of the washing machine. Therefore, the weight of the load is not evenly distributed in the machine. Remove all the clothing placing them in a laundry basket. Make sure there are no objects in the basin of the machine that could cause further problems. Look for items like ink pens, coins or other objects that were not removed from clothing and may have come out in the wash. Now, place the wet clothing from the laundry basket back into the washing machine. Try to distribute the clothes evenly around the machine. Don’t place all the heavy items to one side. Layer the clothing to help ensure the weight isn’t all in the same spot inside the machine. This should remedy the shaking problem. Drain the water out of the washing machine. Most people have washing machines that can pick up washing when then cycle is interrupted. Drain the washing machine completely anyway. To do this select spin or rinse cycles and the water will exit. The load of clothing in the machine were more than likely not washed fully and will need to be rewashed. Wash the load of clothing again. There is no need to add more laundry detergent to the load because there is still detergent in the clothing from the previous cycle. The clothing was not rinse. Simply reset the washing machine to the full cycle you prefer and allow it to run fully.